"Why is it that you white people developed so much cargo, but we black people had little cargo of our own ?" Diamond realized that Yali's question penetrated the heart of a great mystery of human history -- the roots of global inequality. To examine the reasons for European success, Jared realized he had to peel back the layers of history and begin his search at a time of equality -- a time when all the peoples of the world lived in exactly the same way. "Guns, Germs and Steel Part 1 of 18"
"Guns, Germs and Steel Part 2 of 18"
"Guns, Germs and Steel Part 3 of 18"
"Guns, Germs and Steel Part 4 of 18"
"Guns, Germs and Steel Part 5 of 18"
"Guns, Germs and Steel Part 6 of 18"
On November 15th 1532, 168 Spanish conquistadors arrive in the holy city of Cajamarca, at the heart of the Inca Empire, in Peru. They are exhausted, outnumbered and terrified -- ahead of them are camped 80,000 Inca troops and the entourage of the Emperor himself. Yet, within just 24 hours, more than 7,000 Inca warriors lie slaughtered; the Emperor languishes in chains; and the victorious Europeans begin a reign of colonial terror which will sweep through the entire American continent. Why was the balance of power so unequal between the Old World, and the New? 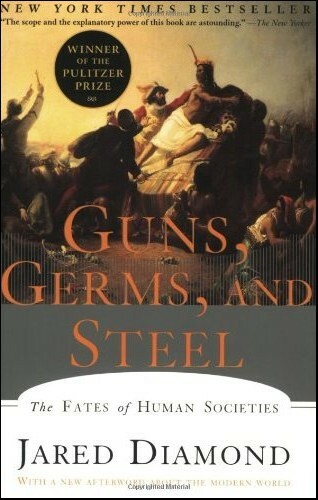 Can Jared Diamond explain how America fell to guns, germs and steel? "Guns, Germs and Steel Part 7 of 18"
"Guns, Germs and Steel Part 8 of 18"
"Guns, Germs and Steel Part 9 of 18"
"Guns, Germs and Steel Part 10 of 18"
"Guns, Germs and Steel Part 11 of 18"
"Guns, Germs and Steel Part 12 of 18"
So far, Jared Diamond has demonstrated how geography favoured one group of people -- Europeans -- endowing them with agents of conquest ahead of their rivals around the world. Guns, germs and steel allowed Europeans to colonize vast tracts of the globe -- but what happened when this all-conquering package arrived in Africa, the birthplace of humanity? 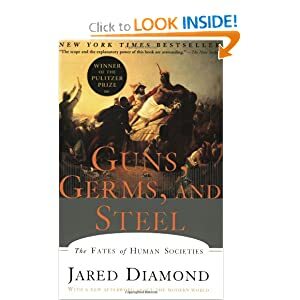 Can Jared Diamond's theories explain how a continent so rich in natural resources, could have ended up the poorest continent on earth? "Guns, Germs and Steel Part 13 of 18"
"Guns, Germs and Steel Part 14 of 18"
"Guns, Germs and Steel Part 15 of 18"
"Guns, Germs and Steel Part 16 of 18"
"Guns, Germs and Steel Part 17 of 18"
"Guns, Germs and Steel Part 18 of 18"